PLEASE NOTE: the Trio 14 is not currently in production, which we plan to rectify later this year (2018). This page is therefore here for information purposes only, and because from time to time we have brokerage (ie secondhand) Trios available. This does not affect the availability of any of our other boats. The Nestaway Trio multi-purpose-boat is 14ft long, can be paddled, rowed, or motored, and splits into three nesting sections that will fit in the back of an estate car or small trailer for easy transport. 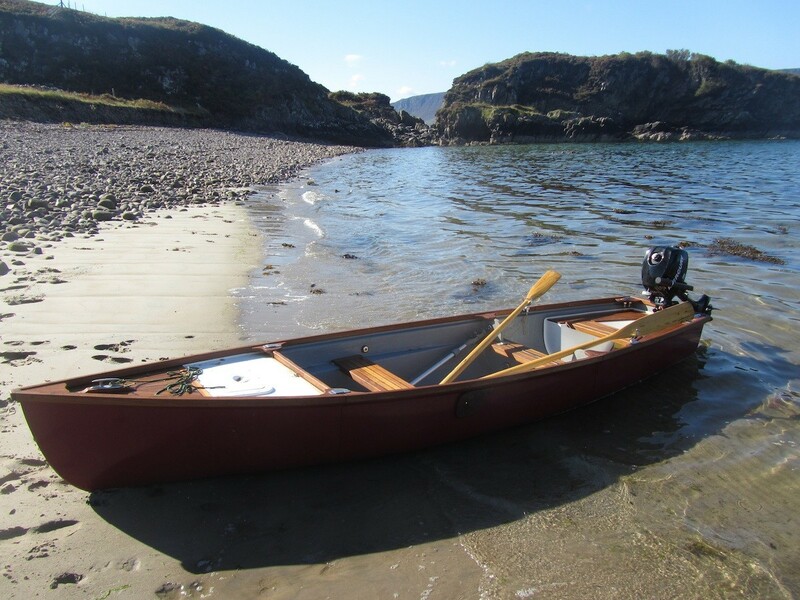 Drawn to our unique specification and design, she will take three adults (or two plus two children) for a nice day out on the river, or has plenty of space for a couple of blokes and their gear on a fishing trip. 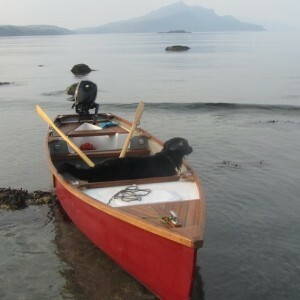 She is primarily a “square stern canoe”, with a transom at the stern, and slightly flattened sections aft to enable her to plane and improve stability. Her long, lean shape is very efficient, also making her a fine candidate for electric drive. The Trio 14 hull is moulded in glassfibre with Iroko trim, or Teak as an upgrade. This photo shows the full foredeck version – in most other pictures you will see the half foredeck moulding. The full foredeck adds buoyancy but takes away storage space: a no-cost option/choice. 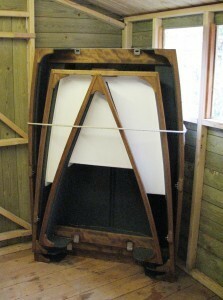 bow and stern fitting inside the middle for easy storage and transport. The bow section is 90cm wide, 125cm long, weight 14kg; the stern section 105x137cm, weight 21kg; and the middle 108x160cm, 30kg. The sections can be carried individually if any distance is involved. 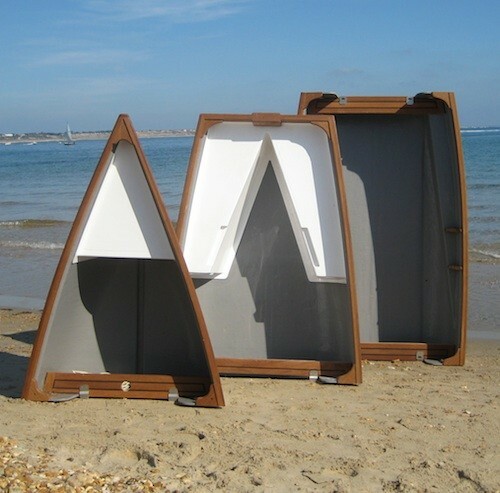 The nested sections can be stood upright, so you can keep her in the corner of your shed, garage, beach hut, or even a large cupboard. The ability to keep her indoors means less maintenance/storage. If you don’t have an estate car, or need the back of it for people and luggage, the nested Trio 14 fits very neatly inside a 6x4ft box trailer as shown here. 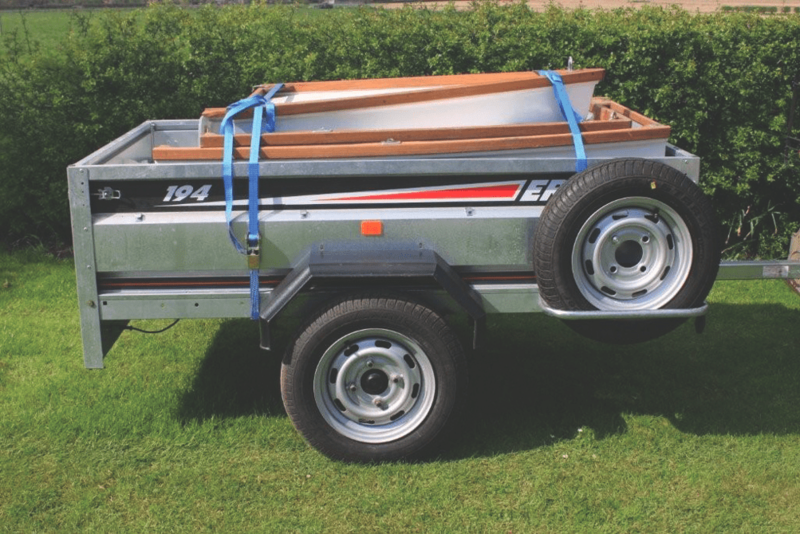 It’s cheaper to buy – also easier to tow, park and store – than a boat trailer… and, when your Trio’s not in it, you still have a useful general-purpose trailer. We are often asked if the Trio can take a bigger engine than 3.5hp (our maximum recommended size), and the short answer is no. Although the hull shape has the potential to be faster with more power, the extra speed would incur stresses that she is not designed for. Hitting even a small wave at, say, 20 knots has a lot more than double the effect that the same impact at 10 knots would. To withstand such forces she would need to be more heavily built, making transport and assembly of the sections more difficult. And, in most places that she is intended to be used, the speed limit is much lower than she can achieve with 3.5hp. The owner of this lovely burgundy-hulled Trio 14 sent us this photo from his exploratory journeys around the Isle of Skye, almost always accompanied by dog. Her shallow draft means they can reach many places that other boats can’t – but he does take care with the weather and sea conditions. The Trio is much more stable than you might think, as she is relatively flat-bottomed (in the middle and aft), carrying her beam right out to the sides (she has quite a “hard turn of the bilge”) over much of her length. A 90kg person can stand at the side of the middle section without dipping the gunwhales under, and an outboard can be installed by one person at the stern (ie nobody counterbalancing forward) without tipping her up. However we must point out that like all small, open boats, her capabilities are limited. She is 14ft long, but a relatively “small” 14 footer, developed from a canoe hull form with wider, flatter stern sections. Many “boats” of the same length have two or even three times her volume. She is primarily designed for use on sheltered inland waterways – lakes, rivers, canals, estuaries, harbours etc – where she will provide much fun. She is not intended for use in large waves at sea, but reasonably loaded there is no problem leaving the harbour on a nice calm day to visit the cove round the corner, provided you know what you’re doing. Nonetheless under RCD testing (using the standard they do have, for wider-beamed craft) she rates Category D for two adults plus motor, luggage etc. There is built-in permanent buoyancy in all three sections. At extra cost (and weight) we can foam fill the tanks and/or fit extra buoyancy under the thwarts if you are particularly concerned about this issue, perhaps if you have young children. Most other open “canoes” – including those with transoms and clearly designed for use with a motor – do not have any built-in buoyancy, and have no RCD rating, so the Trio is significantly ahead in this respect. If she is a canoe then we would say she can take at least three adults, or two plus two children. Other square stern “canoes” of equivalent size seem to quote a lot more than that. She was not over-endowed with stability or freeboard at this point but could be motored around a large lake (cautiously to begin with!) without mishap. Like all small boats (and canoes!) her capability is largely dependent on the type of water you’re using, the weather conditions, and the experience of those on board. The four pictured are not wearing buoyancy aids, but we do recommend you should (again as with any small craft). We have had a number of enquiries about using the Trio 14 as a yacht tender, and can certainly see her appeal in this role. In many of the Caribbean islands for example, if you anchor in a nice bay there is usually a river in the corner that begs exploration. Her easily-driven hull means you’d only need a small, light outboard that can be handed on/off the mother ship – much easier than the 10-15hp lumps that most cruisers seem to use on their inflatables. And her elegant shape will draw conversation, especially if you were to “go electric” and motor round the bay in near silence. In practical terms the sheer (upward curve) of the Trio’s bow section means she does not store as easily upside down as our Pram Dinghy, but suitable chocks could be built to do this. 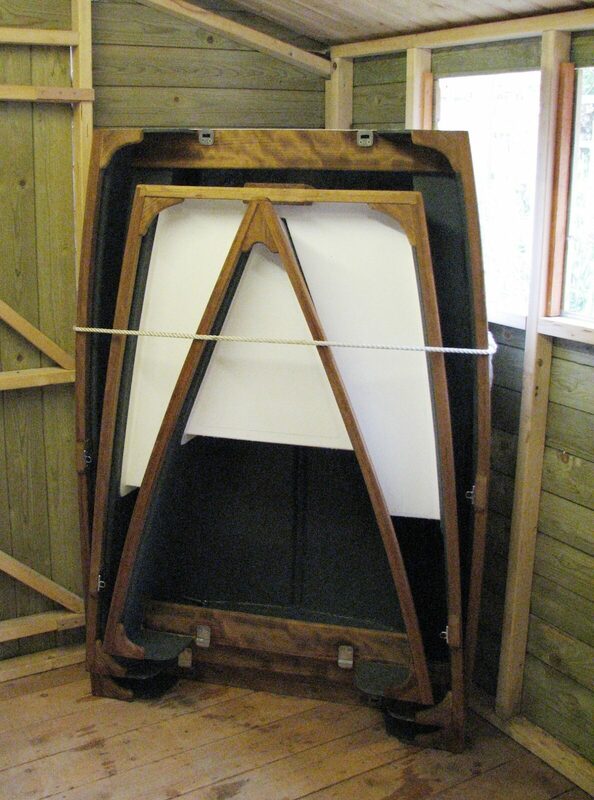 We think the better alternative would be a cradle to store her right way up, with a cover incorporating webbing straps as a tie-down mechanism. That would make assembly of the sections easier too. Launching her would require a four-point sling and halyard, but the attachment points are already there (the joining bolts), and even fully assembled she is still lighter than many RIBs.